Hummingbird Flower Garden. All the Resources to Succeed. "all the resources to succeed right here"
The first steps to plan your garden. but "luck" that brought my first hummingbird to our garden." With curiosity, I watched a hummingbird zoom from bloom to bloom not yet understanding how simple attracting more birds would soon become. The first step to a garden is finding the best plants that attract hummingbirds. 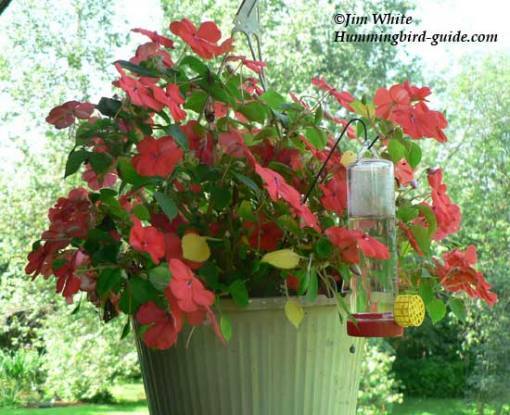 Here, you will find a list of annuals, perennials, bushes/shrubs, trees and vines that will attract hummingbirds. You will also find the best plants that thrive in your planting zone with our hummingbird flower garden planting zones page. We compiled a list of plants preferred by hummingbirds and sorted them for you by zone. Use the USDA Zone Map and compare the Minimum temperatures (the lowest winter temperatures) of your area to get the zone of your location. After you have picked out your plants, you can visit our garden plans page to learn how to plan your hummingbird flower garden. Here you will find design advice and planning tips to consider for attracting hummingbirds to your garden. but have no space for a garden? Perhaps you are a back porch gardener who only likes to set out a few pots or hanging baskets of flowers. Here is our video of a hanging flower basket filled with Impatiens and our flower basket hummingbird feeder. Below is an example of one of our hanging baskets planted with impatiens and a planter hummingbird feeder. 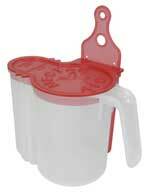 This works well for those of you who are apartment dwellers with no space to plant a hummingbird flower garden. Some will use a planter hook to hang outside a door or window. If you have a balcony or deck you might hang it from a soffit and enjoy your hummingbird visitors while relaxing on your outdoor furniture. Landscape with a Hummingbird Vine. Hummingbird vines are especially prolific and enticing to hummingbirds. They can be a beautiful addition to your landscape. 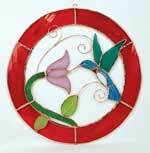 Visit our hummingbird vine page. We offer some tips on how to plant and care for a hummingbird vine. Planting a Hummingbird Flower Garden can give hours of enjoyment! Here is a package deal that we found from our friends at Direct Gardening. 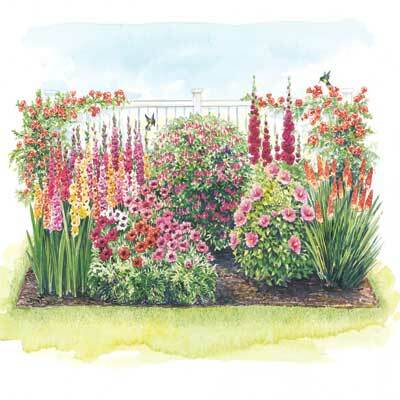 Hummingbird Garden Collection designed to fit a space 10' wide x 8' deep. An irresistible color combination for hummingbirds. Attract charming hummingbirds to your yard with these seven vividly-colored favorites. Plus they include a FREE planting diagram to match the illustration shown. 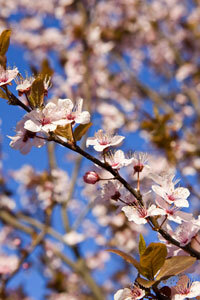 If you are looking to buy individual hummingbird flowers online for your garden may we suggest Direct Gardening. There are hundreds of varieties of hummingbird plants in North America alone depending on your planting zone. Learn about Salvia Sage for Hummingbirds. Learn about Phlox for Hummingbirds. Learn about Bee Balm for Hummingbirds. Learn about Hostas for Hummingbirds. Learn about Butterfly Bush for Hummingbirds. 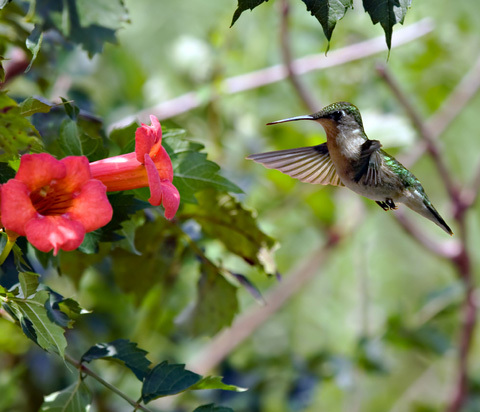 Learn about Trumpet Vine for Hummingbirds. Learn about Morning Glory for Hummingbirds. Learn about Honeysuckle for Hummingbirds. What a marvel it is for me today to watch hummingbirds pollinate my flowers by dipping their bills into each bloom for the nectar. The pollen clings to their bills and gorgeous iridescent feathers. As the hummingbirds fly from flower to flower, pollen is transferred. The pollen fertilizes the flowers and everyone is happy. The hummingbird who enjoyed a good meal. The flowers who's survival is ensured. And you the proud owner of a beautiful garden with numerous birds. As pollinators, hummingbirds benefit our natural environment. When planting a hummingbird flower garden, never use chemical fertilizers or pesticides. Doing so can harm hummingbirds and the good earth.